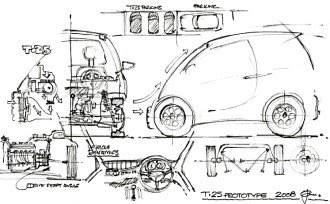 We’ve been keenly awaiting more details of Gordon Murray’s forthcoming T.25 city car, and on the first anniversary of the project’s founding Murray provided more insight than we expected. 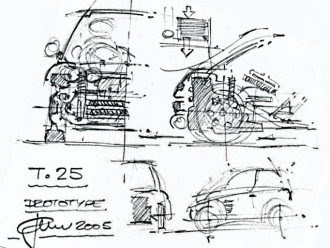 A newly released sketch shows that the design thinking has progressed – the proportions of the beast in the sketch are different to a similar sketch dated 2005. The front axle line is further forward, the wheels are smaller, the cab is further forward. But much more can be gleaned from Car Magazine’s photos from the anniversary event. There, a T.25 prototype or styling buck wrapped in foil gave more than a hint at the finished product. 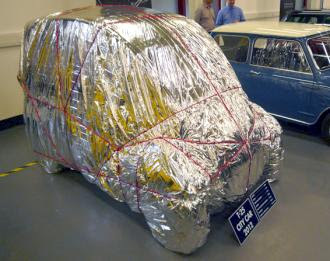 Through the silver wrappings we can see that the car is Renault Kangoo tall, has a very upright rear, and has very clearly defined front wings - or perhaps even cycle-style front mudguards. More intriguing still, it looks as if the A-pillars dive inwards as well as downwards as they curve towards the T.25’s nose. The windscreen will clearly be a lot wider at its top than at its base. Which makes us wonder... Normal two-abreast front seating would seem to offer pretty poor forward vision, with an A-pillar cutting right across the driver’s view. So it’s tempting to guess that the T.25 might offer a central driving position, perhaps with two passenger seats set further to the rear. This is, of course, exactly the seating arrangement found in Murray’s McLaren F1 supercar. Car Magazine’s report says there will be four seats, but the details released by Gordon Murray Design are less specific. If there are four seats inside, passengers will sit very upright and will have to be good friends. The company does say that NCAP 4-star protection will be offered, and it’s hard to see how this will be achieved. 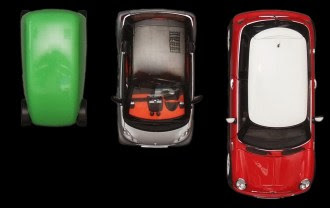 Images released by the company show that the T.25 will be shorter and narrower than a Smart ForTwo. And while we don’t doubt Murray’s ability to design a stiff, crush-proof passenger cell, we wonder where the energy absorbing crash structures will go. These are important for slowing down the overall impact so that accelerations are tolerable. After all, there’s no point in keeping the passenger compartment intact if the G-loading is sufficient to snap the occupants’ necks. These questions will all be addressed, of course. And given the pace of the project to date, we may see the finished T.25 much sooner than we expect.